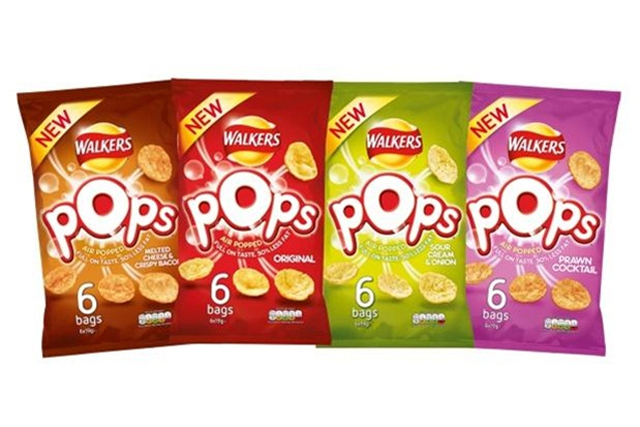 PepsiCo is looking to capitalise on growth in the "popped" snacks market with the launch of a Walkers Pops sub-brand. The company claims the snacks, made using high-pressure cooking rather than baking or frying, offer "full-on taste" with half the fat of its standard crisp products. Popped snacks have grown in popularity in the UK since the launch of US brand Popchips in 2012. Supported by an ad campaign featuring pop star Katy Perry, Popchips UK sales last year reached £4.6m, according to data from Nielsen. Kellogg’s entered the market with its Special K Cracker Crisps range, while several supermarket chains have also started offering popped snack lines. The Walkers Pop range, which hits supermarket shelves next month, will come in four variants: Original; Sour Cream & Onion; Melted Cheese & Crispy Bacon; and Prawn Cocktail. It will be supported with a TV ad campaign in March, alongside in-store sampling activity, according to reports. PepsiCo has already rolled out the range in the US and Netherlands under its Lays brand. Separately, Walkers recently revived its 'Do Us a Flavour' campaign encouraging consumers to nominate their new flavour ideas, with the person suggesting the most popular variant winning a £1m prize.